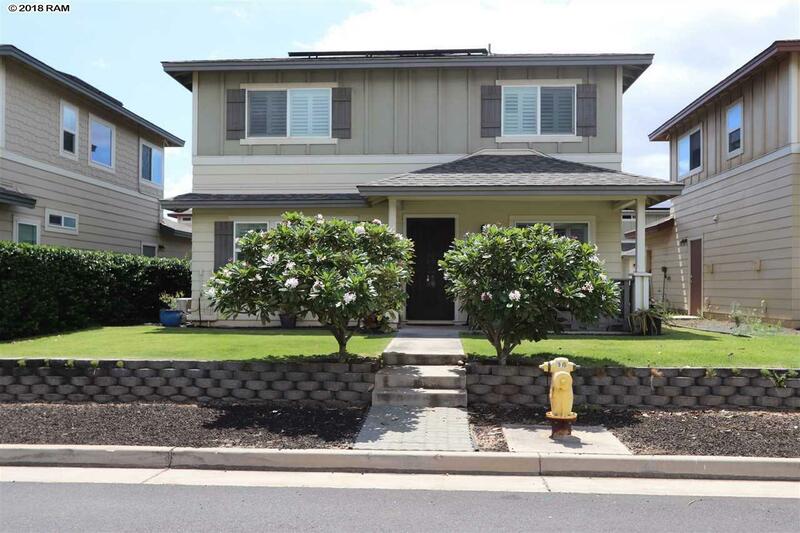 Incredible opportunity with this meticulously maintained 3 bed 2.5 bath two level home in the beautiful neighborhood of Traditions at Maui Lani. This home comes equipped with upgraded features such as stunning plantation shutters throughout the house. Large wooden Minka air fans in every room. The open floor plan design is complimented with a large upgraded Kitchen that has ample counter space for cooking, dark cherry wood cabinets, stainless steel appliances including dishwasher and built in microwave and a breakfast bar with Hawaiian style rattan stools. This beautiful home comes with photovoltaic solar panels and solar water that are owned and fully paid off. New Mitsubishi A/C compressors with heating elements for maximum comfort throughout the home. Both front and back entrances have glass insert doors and storm doors to allow light and airflow inside. 365 Uluna St has two entrances with access to the garage from the alley behind it giving the home more space around it from neighboring properties. In addition, the home has had the front lawn raised and leveled supported by a retaining wall making the outside green space perfect for children or pets to play on. The lawn has Rainbird irrigation installed and two flowering plumeria trees that can be enjoyed from the front patio. Traditions at Maui Lani has a communal water park for children to play at and is directly across the street from Pomaikai elementary school.